This mild heat, chunky salsa and dip is ready to eat straight from the jar or use as a marinade. 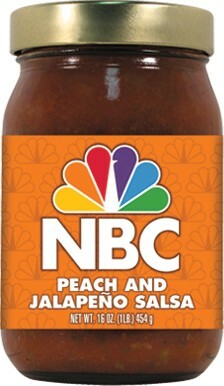 A sweet and smooth blend of peaches with tomatoes, onions, pineapple juice, green chile peppers, jalapeno peppers, garlic, cilantro. Flavor Profile: Southern. Heat Profile: Mild. Large imprint area plus wrap around for additional message, tag line, contact info, website, QR code. Available in Two or Three Pack Gift Set with other 16oz items.